Yesterday I covered the extraordinary case of a New York appellate court upholding a punitive damage award against a doctor. The doctor, it seems, thought it would be a great idea to destroy evidence after a six-year-child she was caring for died. This was extraordinary because it was the first time we allowed punitive damages for the spoliation of evidence that was designed to evade liability — as opposed to punitive damages for the conduct that actually caused the injury. But in doing the analysis of “how much is too much” that comes with punitive damage awards, the Appellate Division (Second Department) cited some dicta from a United States Supreme Court decision that doesn’t actually stand for the proposition for which the New York court was using it. From there the appellate court further reduced the award to $500K. (The underlying verdict for medical malpractice and wrongful death was $400,000 in pain and suffering and $100,000 in monetary loss.) The court used a 1:1 ratio of punitive:compensatory. The legislative sanctions provided for comparable misconduct. Essentially, the New York court simply doubled the compensatory damages to find a decent number for punitive. The problem with that plucking is that both State Farm v. Campbell and Gore v. BMW were commercial cases. Gore dealt with punitive damages against a car dealer that repainted a new car that had been damaged, but had failed to disclose it. The compensatory damages were just $4,000 and the punitive damages were $4M. And State Farm dealt with Campbell causing a terrible auto collision, and State Farm acting in bad faith in defending its insured. The personal injuries of the victims were not at issue, but rather, the contract between State Farm and Campbell. The Gomez case, by sharp contrast, dealt with the child that died and is therefore most definitely a personal injury case, of the medical malpractice variety. The problem inherent in the Second Department’s decision in Gomez is that it it simply cited the single-digit ratio formula and seemed to set down a benchmark by citing to State Farm, whereas State Farm was clear that no benchmark was possible. Nonetheless, because there are no rigid benchmarks that a punitive damages award may not surpass, ratios greater than those we have previously upheld may comport with due process where “a particularly egregious act has resulted in only a small amount of economic damages.” Ibid. ; see also ibid. (positing that a higher ratio might be necessary where “the injury is hard to detect or the monetary value of noneconomic harm might have been difficult to determine”). The converse is also true, however. When compensatory damages are substantial, then a lesser ratio, perhaps only equal to compensatory damages, can reach the outermost limit of the due process guarantee. The precise award in any case, of course, must be based upon the facts and circumstances of the defendant’s conduct and the harm to the plaintiff. Now it might be perfectly rational for New York’s court to look at the three BMW guideposts and conclude that a 1:1 ratio is sufficient because the underlying damages were $500K. Even using the single-digit ratio formula would have permitted the court to go as high as $4.5M. But setting that “single-digit ratio” down as a marker is a mistake, I think, as that is most certainly not what the Supreme Court intended. Second, if the defendant asks to appeal this to New York’s top court (she does not do so as of right, but needs permission) she may face a cross-appeal by the plaintiff seeking to reinstate a higher punitive damage award. Late Tuesday afternoon, a New York jury returned a blockbuster $50.5 million verdict for a brain injured, paralyzed scaffold worker. Daniel Savillo, who was 29-years-old on the date of the accident, had mis-stepped and fallen while working on a 15-foot high scaffold storage platform on February 12, 2007. Given All-Safe’s complete disregard for safety (discussed infra), the name of this company strikes this Court as very ironic. The nine-day trial before Justice Goodman in Manhattan (who also blogs for the Huffington Post) was, therefore, only to assess the amount of damages. Prior to the trial, the plaintiff had rejected a settlement offer of $8.125M, holding firm in a demand for $14.5M. Given the breathtaking jury verdict, as well as the huge settlement offer that had been rejected, it’s worth taking a closer look at the verdict and damages. As a result of the fall, Mr. Savillo suffered a complete cord injury at level T11 and had no sensation below an inch below his umbilicus. He had spinal surgery, screws, rods and cross-pieces placed in his back extending from from T7 to L2. He also suffered significant brain contusions and hemorrhages, though no surgery was done on the brain. Evidence was presented of traumatic brain injury, with significant cognitive deficits, particularly in mental flexibility, information retrieval, processing speed, visual memory, short-term memory. He is unable to do more than a single task at one time. 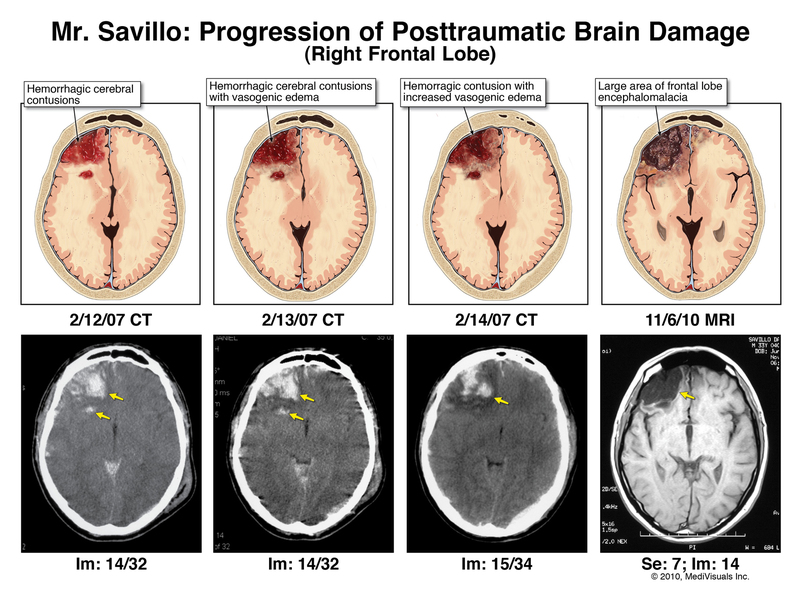 The progression of the brain damage can be seen from this exhibit that was used at trial (click to enlarge). Other injuries consisted of a neurogenic bladder and bowel. This forces him to self-catheterize six to eight times each day for urination, and to manually evacuate stool after inserting suppositories on a daily basis. The jury was unanimous in its determination. And of particular note, two of the jurors were lawyers. One was a fourth year tax associate at a major firm and the other works for the City of New York defending civil rights cases. The plaintiffs called as expert witnesses: a neuroradiologist regarding the films, a rehabilitation expert, the neurosurgeon who repaired the spine an economist, and a vocational rehabilitation expert. The defendants conducted five separate defense medical exams, but didn’t bother to call three of the people that did exams (neurosurgeon, orthopedist and wound care surgeon). The plaintiff also called the defendants’ own rehabilitation expert on his own case, since his report was so devastating to the defendants. The defendants called a neuropsychologist and an economist. All of which is to say, that there were a lot of witnesses in a short amount of time. A final word on the numbers. The jury total is about $50.5M. To that gets added interest, at a 9% annual rate, from the date that summary judgment was granted in September. From that gets subtracted certain things too. For example, the future economic costs must be reduced to present value at a later proceeding pursuant to CPLR 50-B. In addition, there may be a set-off for Social Security Disability payments that have been made, and with reasonable certainty will continue to be made going forward under CPLR 4545. One can also assume that the pain and suffering verdicts will be challenged as excessive. How New York courts go about reducing (or increasing) verdicts from time to time was the subject of one of the first posts on this blog: How New York Caps Personal Injury Damages. In other words, while the headlines will scream $50M, as this one does, the reality will one day be something else. And it will take quite a bit of lawyering to figure out what that will be. The stars seemed aligned for a mega-verdict here, given the catastrophic injuries, that liability was already determined, that 9% interest would be running on any verdict (thus giving a comfort level to the plaintiff regarding the potential for defendants dragging out the litigation), that numerous experts were lined up and ready to go, that defendants had a fear of their own experts, and that an experienced trial lawyer was ready to take the verdict. The case was Daniel Savillo v. Greenpoint Landing Associates, LLC (landowner) v. All Safe Heights Contracting Corp. (scaffolding co., employer). The plaintiff here sued the landowner, who turned around and sued the employer. In New York, those who are injured on the job generally can’t sue their employers under the Workers Compensation Law. Plaintiff’s counsel was David Golomb, who is a past president of the New York State Trial Lawyers Association and a frequent lecturer on medical malpractice (and who I’ve known for many years). He is also a founder of Trial Lawyers Care, the massive pro bono effort put forward by the nation’s trial lawyers in response to the September 11 attack and the establishment of the September 11 Victim Compensation Fund. He was assisted at trial by Roy Jaghab, of Jaghab, Jaghab & Jaghab. Greenpoint’s attorney was Edward Lomena. All Safe’s attorneys were Scott Miller and Michael Manarel. How Much is a Breast Worth? The fact pattern is not complex: A 32-year-old single woman had a mastectomy. But she didn’t have cancer. 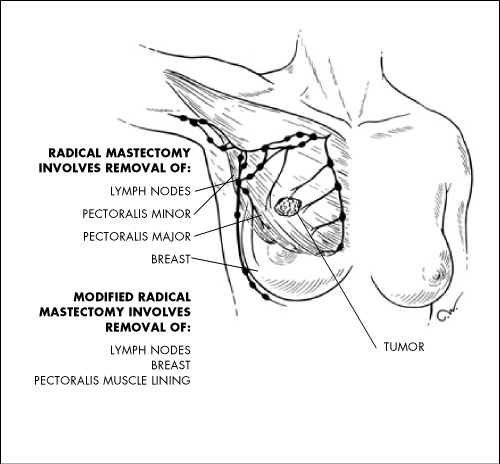 The modified radical mastectomy was unnecessary. A Bronx jury found malpractice and awarded her $3 million for past pain and suffering and $3.5 million for future pain and suffering extending over 41.9 years. The trial judge then directed a new trial as to damages unless the plaintiff stipulated to a reduced total award of $1 million. The legal arguments are not about the issues of liability here in Williams v. New York City Health & Hospitals Corporation, but as to what is considered an excessive verdict. Up the case went to the Appellate Division, First Department (which, for out-of-towners, sits in Manhattan). 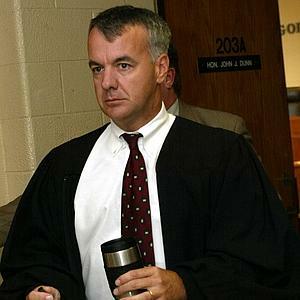 And a divided panel agreed with the trial judge and set the limit for such a case at $1M. There was a furious dissent by Judge James Catterson, who agreed that while the verdict was excessive, also believed that the $1 million award substantially undervalued the emotional trauma of such an incident to a 32-year-old single woman. The dissent’s suggestion that plaintiff must have suffered extreme emotional distress is not supported by the record. Not supported by the record? There was no question that the woman lost her breast unnecessarily. The jury saw photographs. Some injuries are abundantly obvious. And yet, the majority simply accepted the defendants’ argument that there is no proof of future pain and suffering because the plaintiff did not testify extensively about her emotional distress. In other words, if you don’t state the obvious, the court will toss your verdict. Moreover, the majority’s view that the plaintiff’s extreme emotional distress is not supported by the record clearly indicates that the majority has not viewed the photos in the record. Given the post-operative photos of the plaintiff, I believe any testimony by the plaintiff as to distress, for example, over not being able to wear a bathing suit; or of her fears of never finding someone to love or desire her would be simply superfluous, if not overkill. New York, contrary to popular belief, has a means of reducing excess verdicts (and similarly raising up excessively low ones). But it isn’t the one-size-figs-all approach that tort “reformers” want in order to protect the wrongdoers. (See: How New York Caps Personal Injury Damages) And in this case, we see the application of that procedure. Since this appellate decision had two dissenting voices, the plaintiffs may appeal as of right to New York’s high court, which is what I would expect since they have much to gain and nothing to lose. More on this case from John Hochfelder (from whom I swiped the breast image above). He does an analysis of the “similar” cases that the majority and dissent relied upon, and also adds inside info that he got from calling the lawyers involved. The issue of punitive damages in personal injury cases came before the Supreme Court recently. For the second time in this case. And based on the oral argument, possibly not the last. In a highly watched case, Philip Morris v. Williams (05-1256) was argued October 31st, with the Justices hinting it may send the case back to the state court from which it came, instead of resolving an open question: How much in punitive damages should a jury be allowed to award? In Williams, an Oregon jury returned $800,000 in compensatory damages and $79.5M in punitives. Thus began a journey up the appellate ladder in Oregon, where the verdict was affirmed by the state’s highest court, and then on to Washington for an ultimate review by the US Supreme Court. But the Supremes, in the meantime, had decided another punitive damage case (State Farm v. Campbell) and sent Williams back to Oregon to reconsider in light of its opinion. Philip Morris showed indifference to and reckless disregard for the safety not just Williams, but of countless other Oregonians, when it knowingly spread false or misleading information to keep smokers smoking. Philip Morris’s actions were no isolated incident, but a carefully calculated program spanning decades. Thus, Philip Morris asked the US Supreme Court to review again. The State Farm opinion has been the source of much legal discussion. In part, it seems to put limits on the amount of punitive damages that can be awarded, and discusses a ratio of compensatory damages to punitive damages. At one point the court mentions a multiplier of 4x and another of 10x, and in other parts specifically saying that there are no “bright line” tests for how much is too much. The source of the limits is that some justices believe that a large punitive damage award violates the due process clause of the 14th Amendment. What makes Phillip Morris interesting is that it is a personal injury matter, not some commercial dispute. It thus differs from the other cases the high court has heard on the issue. It remains to be seen if the court will create constitutional protections for reckless conduct that endangers the health, safety and welfare of the public, where no such protection presently exists. then the next instruction seems to say they can’t? The court will likely decide the case by June. But don’t be surprised if they avoid the issue and send it back (again) to the Oregon courts to flesh out the issue of the jury instructions.